If you’re a regular reader of this blog then you’ll know by now that I’m a fan of the US bike company Specialized. It’s partly because I really love their products which so far for me includes my bike, shoes, socks and gloves but also because they are great supporters of women’s cycling teams. Many of you would have probably heard of the European based Specialized Lululemon team which is a spin-off from the ill-fated HTC Highroad team that disbanded last year (a blog post coming on that one soon) but Specialized is also working with women’s cycling in Australia at a lower level of the sport. This includes a South Australian team called ‘Specialized Women SA’ which is led by one of its team members Liz Phillipou. They are racing a selected schedule over the next year which will include some National Road Series (NRS) races. I saw them race at the Women’s Cup run by Cycling South Australia during the recent Tour Down Under. The team won the opening race with team member Bec Werner and I was lucky enough to meet Bec the next day at the Specialized stand at the Tour Down Under village. If you want to know more about the team you can read a longer article on Cycling Central. There is also a NSW based team called ‘Team Daisy Chain’ which is being supported by Specialized. 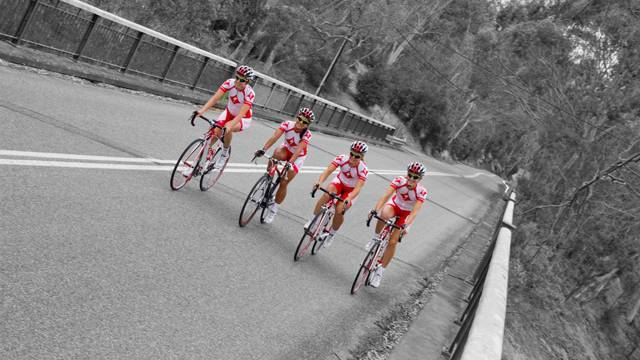 This team is led by Natalie Bates (former pro cyclist and sister of Kate Bates) and is a junior women’s team. Natalie has hand selected the team members based not only on their ability and potential, but also life background to give girls who may not be able to afford to get themselves to races or on to good equipment the opportunity to excel in cycling. Bravo Natalie. Read more about the team here. Matt O’Connor who is the Australian marketing manager at Specialized also tells me that Specialized in putting more emphasis on the women’s cycling market. “Specialized Women (Specialized Bicycles’ Women division) represents one of the greatest areas of potential growth and is one of the least understood markets. Women’s purchasing power has reached astronomical highs and women control 80% of the household purchases. Not only is their purchasing power great, but they are increasingly joining the sport of cycling and looking to dealers and manufacturers to offer the right retail experience and right products designed specifically for women. “You only have to take a look at some of the figures from the past year which shows women’s participation in large scale cycling events across the world and you will see a marked increase in female participation across all age groups. Specialized Women’s products and marketing have evolved greatly over the past five years and so has our understanding of where women get information, how they shop and what types of products and services they are looking for. The next step of our business is to reach out to retailers, opinion leaders, riders and journalists to fully realise the potential of the women’s market. “Our new range (of women’s products) will be released later this year, stay tuned for some exciting new women’s products”, said Matt. I for one am really looking forward to that. Great work Specialized. Next Post:Indoor bike trainers – Do I really need one? @aimzbradley tells me that Specialized is also supporting the Victorian Total Rush women’s team. I’d love to hear about other companies that are great supporters of women’s teams.